Business is booming at Vire Engineering, Totnes, which produces high-quality hose and pipe fittings for race cars, from Clubman up to Formula One, ensuring that brake fluid, fuel, oil and coolant all flow reliably. Vire wanted to bring in-house the production of shaft-type components, which were being put out for manufacture, such as a 148 mm long by 3 mm diameter EN9 hinge pin that was needed in batches of 1,000-off. The idea was to save money and shorten lead-times. Additionally, in view of increasing demand from its customers for turn-milled parts, extra CNC turning capacity was needed. The subcontractor was keen to improve margins on what are highly price-sensitive components and reasoned that the only way to achieve this was to raise productivity by purchasing new, efficient plant. In January 2013, Vire installed its second sliding-head mill-turn centre, a Traub TNL32 twin-spindle, twin-turret machine from Kingsbury, the sales agent for GB and Ireland. The versatile, 36 mm bar auto has the ability to be changed over quickly from sliding-head to fixed-head operation, should that configuration better suit the type of component to be produced. It joined a similar but smaller (20 mm capacity) Traub TNL18P sliding- / fixed-head lathe, which has been in use at Totnes since the beginning of 2012. Apart from bringing sliding-head type work in-house, buying a lathe configured for that style of turning has also lowered cycle times, even during fixed-head turning, as the cutting tools are positioned closer to the workpiece, so slideway movements are short and quick. 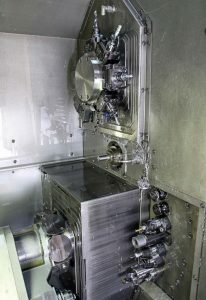 Superior provision of live tooling in the latest Traub lathes, with all stations in the turrets being driven, also plays a big part in ensuring efficient cycles and getting parts off in one hit. Moreover, the finish of the machined surface is nearly always better when sliding-head turning is used.